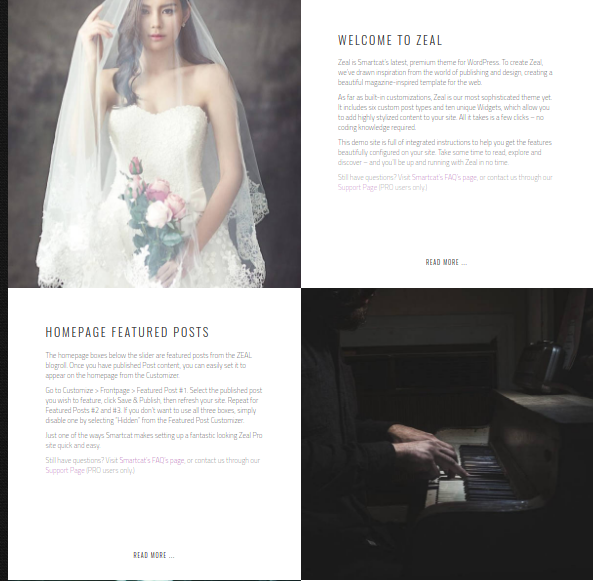 The homepage boxes below the slider are featured posts from the ZEAL blogroll. Once you have published Post content, you can easily set it to appear on the homepage from the Customizer. Go to Customize > Frontpage > Featured Post #1. Select the published post you wish to feature, click Save & Publish, then refresh your site. Repeat for Featured Posts #2 and #3. If you don’t want to use all three boxes, simply disable one by selecting “Hidden” from the Featured Post Customizer.